Have you been considering incorporating fasted cardio into your daily training? Read over this article first to see if this is the right method for you. One type of cardio training that gets discussed at a very high frequency rate is that of fasted cardio training. The thinking behind this set-up is that you'll get up first thing in the morning and before downing your usual breakfast meal, you'll head straight for the gym and get in a good 30-60 minutes of cardio first. By doing so, the hopes are that you'll turn directly to your body fat stores for energy rather than utilizing the current glucose in the system as you would be doing had you have had something to eat prior to doing the session. Some people are quick to shun fasted cardio however, saying that by doing it you're just going to be setting yourself up at an increased loss of lean muscle mass. Some just don't like the idea—period. Others relish the idea of tapping into that stored body fat easier than before and wake up eagerly every morning without ever skipping a beat to hop onto that treadmill in hopes that it'll mean them waking up leaner the next morning. Who's right in their beliefs? Is fasted cardio a form of cardio training that you should be doing? Let's dig a bit deeper and uncover some of the need-to-know facts about fasted cardio training. First things first, you need to assess what your overall program goals are. Are you looking to melt body fat? Are you looking to build lean muscle mass? Perhaps you want to boost your sports performance? Identifying what the main goals that you wish to accomplish will be important here because what might be great for one particular goal could be a horrible idea for another goal. When it comes to fat loss, since it is a fact that you can target the body fat stores easier when doing fasted cardio, this does prove to be advantageous. But, before taking that as the word that fasted cardio is all you should be performing, keep in mind that fat loss is still heavily dependant on your diet. If you go into the gym and burn off 300 calories from that fasted cardio and all those 300 calories are coming from fat stores in your glutes, but then you go and eat 300 more calories that day than what you've burned off over the entire 24-hour period, guess what? That's right, you are no further ahead. While you may burn off more fat doing fasted cardio, this doesn't necessarily mean you will see a net fat loss over the course of the day. That comes down to what your diet plan looks like. Some people who are looking to build lean muscle mass will also use fasted cardio because they figure by doing so they are increasing their chances of staying lean as they go about the muscle building process. Keep in mind that fat loss is still heavily dependent on your diet. Remember here that anything that compromises your recovery is going to compromise your ability to build muscle mass. Since you're likely going to be putting in extremely hard workouts during the week to reach the goal of building more muscle tissue, if you aren't recovering from those, you aren't going to move forward. Given that cardio training is still exercise and will still stress your system, especially in a fasted state, there isn't really a dire need to do fasted cardio when the goal is muscle mass building. Only on very intricate set-ups where you may be utilizing a zig-zag calorie approach where you attempt to build muscle on certain days of the week and lose fat on others will this possibly be a consideration. But that approach is best left to higher level trainees anyway. For the average person trying to build muscle, leave fasted cardio for another time. In the discussion of fasted cardio, one question that often does come up is whether or not this will promote the loss of lean muscle mass. You work hard in the gym each and every day and the last thing that you want to do is see your hard-earned muscles start disappearing from your body. The key point to recognize here is that if you're keeping the cardio to a moderate intensity, there shouldn't be too much of a problem with muscle mass loss. It's only when you attempt to do higher intensity forms of cardio in a fasted state that you'll really have to worry. To add to that, fasted cardio that is more intense in nature is typically a very bad idea anyway, so you're really best just staying away. If you are ultra concerned about lean muscle mass loss while doing fasted cardio, a quick way to remedy the situation is to take 5-10 grams of branched chain amino acids beforehand or a scoop of whey protein powder. Just remember that those calories will count toward your daily calorie total so if you're on a fat loss diet they must get added in. Now, when it comes to the benefits of fasted cardio, they may be more than you originally realized. Most people think that the primary benefit of fasted cardio is that enhanced fat burning effect. While this definitely is one of the benefits that it provides, it's definitely not the only one. First, with regards to the fat that is burned during fasted cardio, more than any other form of fat burning exercise, when done in a fasted state like this you will have a greater ability to target the stubborn fat stores on your body, which include the hips and thighs for women as well as the abs and lower back for men. These areas of the body tend to be more resistant to giving up their fat stores and are why these are generally the very last places that you'll lose body fat as well. 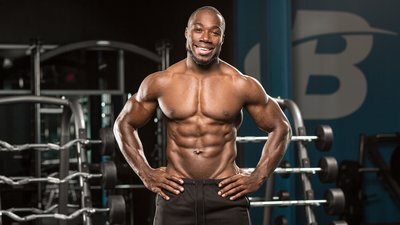 In addition to that, if you supplement with caffeine along with yohimbe before doing your moderate intensity fasted cardio, which are supplements that will help to boost the levels of catecholamines in the body, which then stimulates fat burning enzymes to make fatty acids more available to be burned off, you'll see even better results yet. After assessing the increased fat burning effects of fasted cardio, the next thing to look at is the fact that some studies suggest that fasted training actually enhances the adaptations to your workout session. In one study that was published by the Institute of Food Nutrition and Human Health in New Zealand researchers assessed the adaptations to endurance training that were seen in subjects that were either fed carbohydrates right before going into the workout session or who were coming out of an overnight fasted period. They had eight female and six male untrained, healthy subjects take part in the study. Throughout the four weeks of training, they were to do five days of cycle ergometer endurance sessions after which their respiratory exchange ratio, their plasma glucose, their lactate levels, and their free fatty acid concentrations were assessed. After all the training had taken place, the researchers noted that the male subjects did respond better to the fasted protocol than did the female subjects and that those participating in the fasted group actually saw a greater increasing overall VO2 measurements as well as muscle glycogen concentrations. So from this we can take away that if you want to boost your VO2 max levels, fasted training may just be the way to go. Likewise, if you're an endurance athlete and are trying to greatly increase the amount of carbohydrate storage your body is able to hold so that come race day you can go harder for a longer period of time, doing your training fasted and then following that up with a very high carb, high calorie meal may prove to be advantageous. You'll store more carbohydrates in the muscle cells coming out of a fasted workout than you otherwise would. So if you've weighed the pros and cons of fasted cardio and have decided that you do in fact want to add it into your program plan, how do you go about doing so? First you need to decide on the frequency. Since you are or should be keeping the overall intensity much lower, you can do this on a daily basis if necessary and you think it would be helpful for fat loss purposes. Just keep in mind that if you do feel the strong need to do daily fasted cardio sessions, this could be an indication that something isn't quite right with your diet plan. Make sure you have that diet under control first and then go about adding fasted cardio if necessary afterward. Second, consider supplementing with your BCAA or whey protein powder before the session. This will help to further reduce any chance of lean muscle mass loss and if using whey powder may also help to reduce any light-headedness you may otherwise experience. There's no question that fasted cardio can be a very beneficial training aid when used properly especially with regards to those few performance factors that were mentioned earlier. Buckley, AJ. et al. (2010). Adaptations to skeletal muscle with endurance exercise training in acutely fed versus overnight-fasted state. Journal of Science and Sports Medicine. Jul;13(4):465-9. Bonen, A. et al. (2008). Effect of training in the fasted state on metabolic responses during exercise with carbohydrate intake. Journal of Applied Physiology. Apr;104(40):1045-55.